NASA’s MESSENGER mission to Mercury, carrying an instrument designed and built at LASP, is slated to run out of fuel and crash into the planet in the coming days after a wildly successful, four-year orbiting mission chock-full of discoveries. The mission began in 2004, when the MESSENGER spacecraft launched from Florida on a seven-year, 4.7 billion mile journey. The tour involved 15 loops around the sun before the spacecraft settled into orbit around Mercury in March 2011. 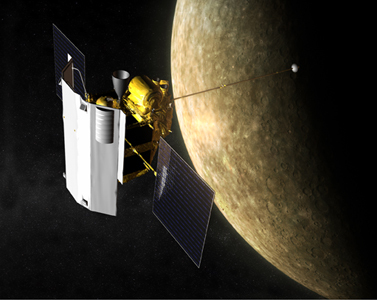 LASP provided the Mercury Atmospheric and Surface Composition Spectrometer (MASCS), which has been making measurements of Mercury’s surface and its tenuous atmosphere since orbit insertion. “The spacecraft is finally running out of fuel, and at this point it’s just sort of skimming the planet’s surface,” said LASP Senior Research Scientist William McClintock, principal investigator for the MASCS instrument. It could crash onto Mercury’s surface or could run into towering cliff-like features known as a scarps that are evidence of planet-wide contraction as the body cooled, he said. Mercury is about two-thirds of the way closer to the sun than Earth and has been visited by only one other spacecraft, NASA’s Mariner 10, in 1974 and 1975, which flew by the planet three times. The MESSENGER spacecraft—about half the size of a compact car—is equipped with a large sunshade and is toting a camera, a magnetometer, an altimeter and four spectrometers. A number of wild discoveries have come from the MESSENGER mission: Mercury may have as much as 1 trillion metric tons of ice tucked in the dark recesses of its craters, despite its 800 degree Fahrenheit surface temperatures; dust from comets may have painted its surface dark with carbon; some of its craters were once filled with lava; it has a lopsided magnetic field and a gigantic iron core. During the mission, McClintock and his colleagues used MASCS to make the first detection of magnesium in the planet’s exosphere. The team also determined magnesium, calcium and sodium, the major elements observed with MASCS, show distinctive and different spatial patterns that repeat every Mercury year. Baker said CU-Boulder’s involvement in the MESSENGER mission has helped attract bright and energetic faculty, postdoctoral fellows, and graduate students. Even undergraduates have been participating in the mission, including senior Ryan Dewey, a 2014 Goldwater Scholarship winner who sought out Baker as a sophomore because he wanted to be at forefront of the MESSENGER discoveries. LASP has designed and built instruments that have visited, or are en route to, every planet in the solar system. As the MESSENGER mission to Mercury winds down, LASP has a student-built dust counter on NASA’s New Horizons mission, which launched in 2006, and will make its closest flyby of Pluto—7,000 miles—on July 14th of this year. LASP also built instruments for NASA spacecraft now orbiting Mars (MAVEN) and Saturn (Cassini). The Applied Physics Laboratory at Johns Hopkins University manages the MESSENGER mission for NASA. Sean Solomon from the Solomon from the Lamont-Doherty Earth Observatory at Columbia University is the MESSENGER principal investigator.